Connecticut is within reach of ending chronic homelessness, or the long-term homelessness of those living with severe disabilities, by the end of 2016! The Connecticut Coalition to End Homelessness and the Partnership for Strong Communities are partnering with homeless service providers across the state to rally for the next big push to achieve this historic milestone. Linda Kaufman, Manager of National Movements from Community Solutions, will be the keynote speaker. Below are the times, dates, and locations for each event to be held this week. event will be on Wednesday, May 18th at 1:30-3:30p.m. at Capital Region Mental Health Center on 500 Vine Street in Hartford. Greater New Haven CAN and Fairfield County CAN event will be on Thursday, May 19th at 9:30-11a.m. at the United Congregational Church on 877 Park Avenue in Bridgeport. The Waterbury-Litchfield CAN will be having their event on Thursday, May 19th at 1:30-2:30p.m. at the Covenant Church of Thomaston on 64 Grove Street in Thomaston. The Northeastern CAN and Southeastern CAN event will be on Friday, May 20th at 1:30-2:30p.m. at 1315 Main Street, Suite 2 in Willimantic. 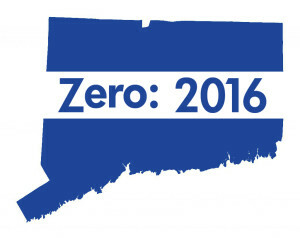 Connecticut is one of four states and 75 communities across the country participating in the Zero: 2016 campaign, which aims to end veteran homelessness, a goal set by President Obama, and to end chronic homelessness by the end of 2016. The federal government confirmed in February that Connecticut was the second state in the nation to functionally end veteran homelessness by housing all long-term homeless veterans and securing housing for any veterans newly identified as homeless in less than 90 days. The 2016 “Point-in-Time” count,or annual snapshot census of homelessness, indicates the number of chronically homeless individuals decreased 20 percent across Connecticut compared to the 2015 count, continuing a sharp downward trend in this population since 2014. Studies show that communities can save up to 70% of public costs incurred by public systems, such as emergency services, hospitalization, and jails, by providing appropriate housing and supports to those experiencing chronic homelessness. “This substantial drop in chronic homelessness is a direct result of the great teamwork of providers in our communities, who are coordinating their efforts, targeting their resources, and working more closely together than ever before to house our most vulnerable individuals experiencing long term homelessness,” said Evonne Klein, Commissioner of the Connecticut Department of Housing. For the full 2016 Point-in-Time count please click here or visit https://cceh.org/wp-content/uploads/2016/05/CT-Counts-2016.pdf.